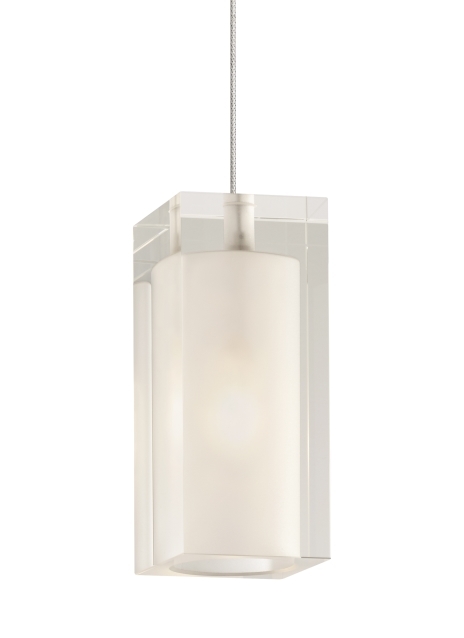 The Solitude pendant light by Tech Lighting features clean sleek lines with its classic geometric rectangular design. This perfectly shaped pendant is made of pressed glass and makes a simple, yet modern statement in any space. The Solitude pendant is available in Amber and Frost along with three on-trend modern hardware finishes for further customization. With its modest size scaling at 6” long and 2.6” in diameter the Solitude is ideal for dining room lighting, kitchen island task lighting and home office lighting. Your choice of fully dimmable halogen or LED lamping ships with the Solitude saving you time and money. Pair the Solitude pendant with the Monorail system by Tech Lighting for greater design customization. Includes low-voltage, 35 watt halogen bi-pin lamp or 8 watt, 300 delivered lumen, 3000K, replaceable SORAA® LED module and six feet of field-cuttable suspension cable. Dimmable with low-voltage electronic or magnetic dimmer (based on transformer).